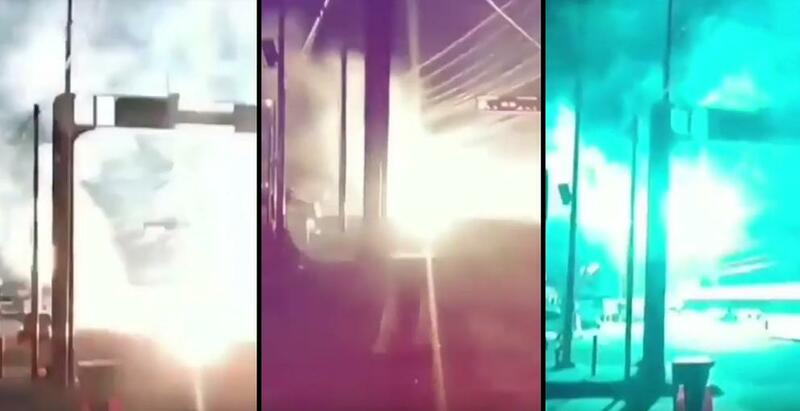 An astonishing sight enfolded in Maracaibo, Venezuela Friday night when an electrical sub-station overloaded plunging the northern part of the city into darkness. This is the fourth time there has been an explosion at the electrical sub-station. The spectacular sight was a terrifying scene as lights exploded all around the streets as debris and live wires fell all around the city. Residents fled the explosions, and one witness took out his phone to film the incredible scene. The source of the explosion was the sub-station itself which looked like an arc welder's flame magnified times by a thousand. Along with the blinding white light was a constant throbbing, thrumming sound of the electricity. The socialist government of Venezuela disarmed its citizens just five years ago and within four years of that, the country declined into a state of turmoil. The witness filming the sub-station overloading can be heard saying in the video "This is Venezuela." The socialist country has been in an economic death-spiral for years and now cannot maintain its electrical grids. THANK GOD A HUNDRED TIMES A DAY TRUMP WON THE ELECTION. GOD HELP IN THE FUTURE!! We are so fortunate for President Trump, but need to stay vigilant or within one presidency we can fall to the socialist plan. Those poor people in Venezuela have seen their last miracle of electric light, as I doubt Maracaibo will see electric service anytime soon? Notice how all these countries that have disarmed their citizens are all falling apart and have nothing but chaos! We would be in the same boat if hillary was elected and we still could be if we don't get out and vote! We need a red tidal wave come november so we can beat the illegal and dead vote! Socialism limps along until the working people become fed-up paying the High Taxes to support those sitting in their Asses at their hard working expense.